Ezugi offers a wide range of Live casino dealer games that are unique within the gambling industry. Quite new on the market Ezugi started operating in 2014 but the games can already be found on major brands. Scroll below to play Ezugi live dealer games. 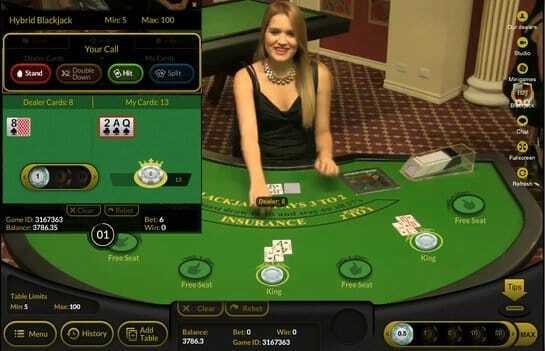 As time goes by casino players are getting more into the live casino action, playing directly with live studio dealers. Ezugi specialises in offering the latest technology and gaming experience on popular games such as live studio Blackjack, Roulette, Bacarrat and Texas Hold’Em Bonus Poker. Unique games that can be found on Ezugi are the Wheel of Dice, Live Studio Keno, Live Studio Lottery, Perfect Pairs which is a variation of Blackjack with a side bet, Caribbean Stud Poker and the latest Double Ball Roulette.